Looking for a kitchen scale that does it all? 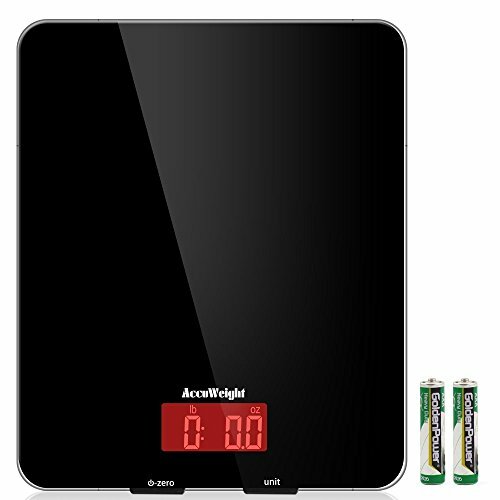 The AccuWeight Digital Multifunction Food Scale is popular, highly rated and affordable. Its glossy design is appealing to the eye, and its functionality goes far beyond simple measurements. Tare Function: This device features tare functionality. That means you can put an empty container on top, and the device will then reset the weight to zero. You then can pour in what you want to weigh without the device adding in the weight of the container. Auto-Off: After a couple of minutes of inactivity, the scale shuts itself off automatically. This saves you time, especially when you have food on your hands. Other Great Features: Additional helpful features include a low battery indicator, overload protection, and unit conversions. Accuracy is to within 1%. If you are cooking at home for yourself and your family, this will generally be all you need. The top is liquid-proof. This unit is capable of fluid measurements. Furthermore, if you happen to spill liquid on top of it, it should still work. I can attest to this because I did spill water on the model I was testing, and it survived the ordeal! Appealing design. The polished glass has a beautiful look to it. While you can easily stow this scale in a cabinet, it would actually enhance your countertop. Great customer service. I read some customer reviews where buyers had some quality control issues (see below), and the company was fast to respond and replace their scales for free. It is easy to turn on by accident. This is because the buttons are located in front. If you push it back a bit on your countertop, however, this should not be a major issue. There may be some quality control issues. Some buyers said their scales were not as accurate as advertised. Thankfully this design flaw seems to affect very few of the scales, and as previously mentioned, the company seems to be entirely good about replacing them. I had no issues with the accuracy of the model that I tested. Consider purchasing this scale if you want one which can complement any kitchen countertop and which you can clean, maintain, move and store with minimal effort. 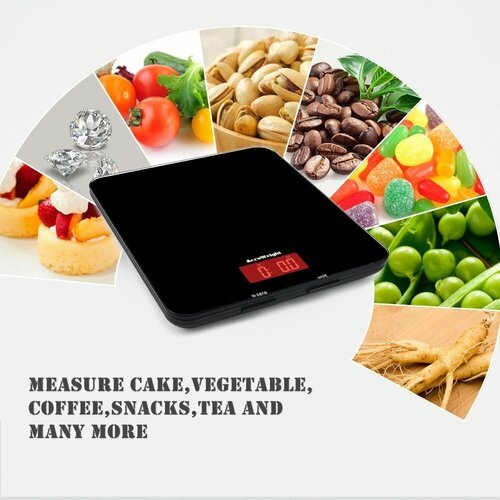 The accuracy on the AccuWeight Digital Multifunction Food Meat Scale is excellent, and the auto-off, tare and other great features make it a great purchase. After testing the AccuWeight Digital Multifunction Scale, I was pleased with its accuracy, unit conversions, build and appearance. Portioning meals is easy with this product, and once you are done with it, it turns itself off so you can get on with your food preparations. I can recommend it to any home chef who wants a powerful unit for a modest cost.